Our Members' Quilt Show is a little over a month away and entries are due this Sunday, August 4, 2013. Please download the entry form here, fill it out, and bring it with you to the meeting on Sunday (or e-mail it to us if you won't be attending the meeting). We will be displaying all mini quilts, but there is limited space for larger entries. We will do our best to accommodate all entries. If there are too many large entries, we will hold a random drawing to select the display entries. Special thanks go out to Eliza and Gina for coming up with this amazing advertisement for the show! Erin, the shop owner, has graciously opened her meeting space to us this month! She'll be taking a few minutes to tell us about her shop. Space is limited, so if you'd like to bring a project to work on, hand sewing would be your best bet. We will also be voting on the recent proposed bylaw changes. Please review them before the meeting so we can get through them quickly and on to more fun topics! Please let us know on Sunday if you plan to submit a mini quilt and/or larger quilt for our show in September! It'll be here before we know it and it's time to start planning. Don't forget to bring some projects for show and tell - we'd love to see what you're working on! See you on Sunday at Stitch Studio! AQS is holding a Modern Quilt Challenge with big payoffs for the winners! There's $6,000 in prize money up for grabs. The entry deadline is coming up quick - August 2nd. Quilts must be completed after January 1, 2010, and must be between 40 inches and 80 inches in both length and width. The entry fee is $30 for non-members and $15 for AQS members. Winners will be announced October 2nd at Des Moines QuiltWeek. A selection of the entries will travel to all the AQS shows for a year. 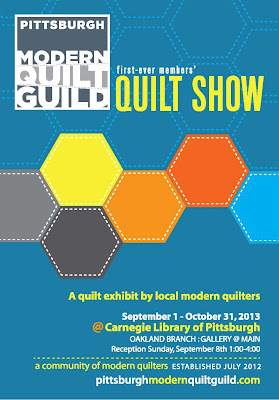 It would be awesome to see the Pittsburgh Modern Quilt Guild represented in the show! Notifications will be sent on August 23, 2013 - let us know if your quilt is in the show! Have you started on your modern mini quilt yet? We'll be displaying them at our first-ever show, to be held during September and October at the Gallery @ Main at the Carnegie Library in Oakland. If you haven't started, I've gathered up a few inspirational mini quilts from Flickr to get your creativity flowing. Aren't they amazing? For this challenge, your mini should be no larger than 8" x 10". The topic is Pittsburgh (what it means to you). 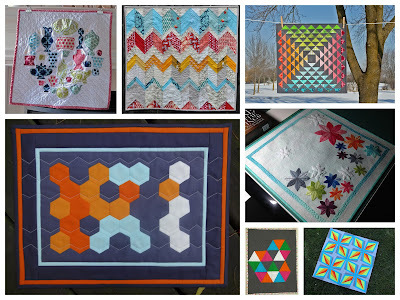 Don't forget to post your in-progress mini quilts on our Flickr group! If you'd like to participate in our challenge, you must be a member of the Pittsburgh Modern Quilt guild. Please let us know if you will be participating by our August 4th meeting. Your mini should be finished by mid-August. Keep an eye out for more details on the upcoming show! ns to all members, especially the founding members/leadership who put a lot of time and effort into the past year to make the PGH MQG such a success! Nineteen members and guests were in attendance – it was such a pleasure to welcome new quilters, catch up with members who were in town this month and, of course, socialize about all things “quilty” among all attendees! There were also some great fat quarter bundles given away as door prizes! The meeting started with a yummy buffet of snacks, desserts and drinks – thank you to all members for contributing goodies that were enjoyed by all! Jodi McLaughlin took a moment to talk about the Guild and the events of the past year. Show-and-tell was a highlight! Gina, Stephanie and Lauren brought their modern mood quilts for an update – best description: WOW! Tamara shared a memory quilt that she is making out of her grandmother’s clothing! It was simply beautiful, and she is making three more! Dia and Lauren are participating in a skill builder BOM from Pile O' Fabric. Their quilt blocks are amazing. 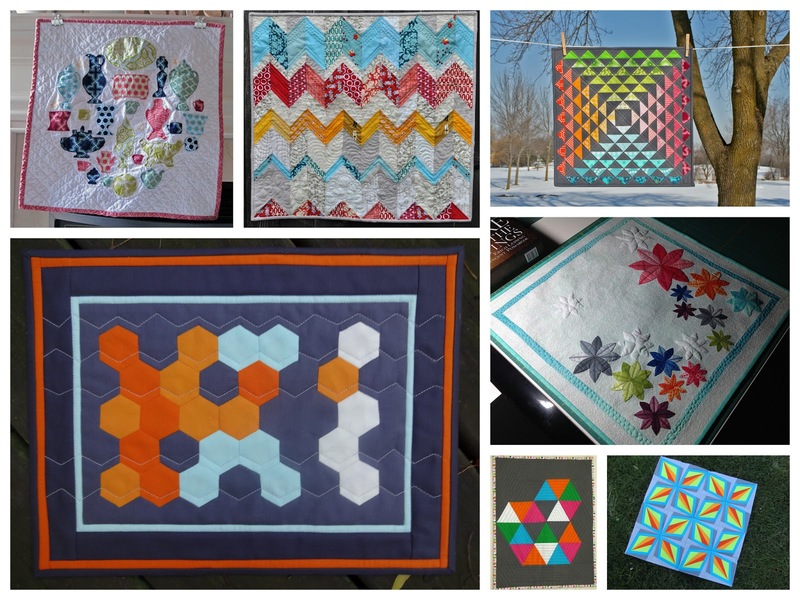 Karen shared several of her modern quilts blocks – beautiful color choices! Melissa made a fun pincushion out of mini hexagons – you can download the templates here. Ginger introduced “Zentangle” to the Guild – a creative way to improve your free-motion quilting skills. Go to http://www.zentangle.com or search “zentangle” to find books and learn more. Time for a bit of business. First up was a review of the Pittsburgh Modern Quilt Guild Bylaws. As the Guild has grown over the past year, various changes in the Guild have necessitated corresponding adjustments to the bylaws. Guild members were each provided with a draft copy of the by-laws. Jodi and Lauren reviewed and explained each proposed change, as well as fielded questions and comments from Guild members. Members were encouraged to read through the entirety of the document at home, and email PGH MQG leadership with any additional questions. A formal vote on the bylaws will be held at the August 4, 2013 Guild meeting. Visit https://www.themodernquiltguild.com for more information and to sign up for their newsletter. 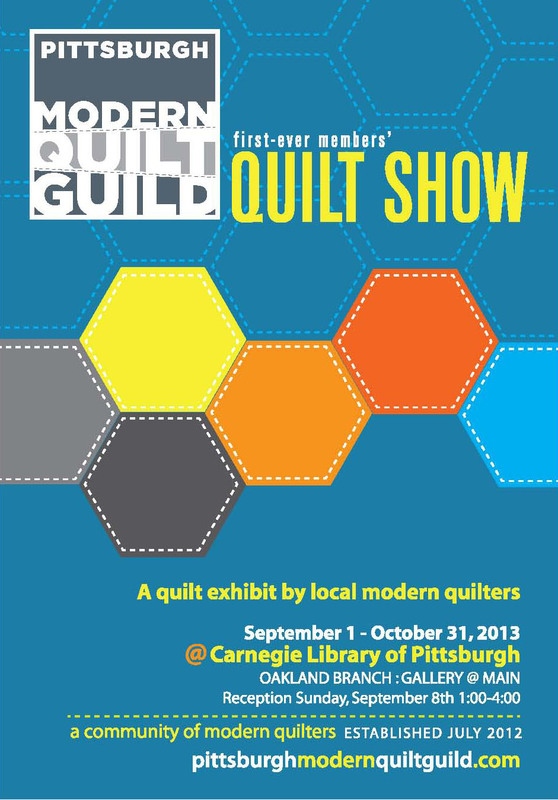 The PGH MQG quilt show at the Carnegie Library of Pittsburgh is fast approaching! The show is slated to run from September 1 through October 31, 2013. Several Guild members had questions about the show. Jodi answered all questions and reviewed additional details about the show. More specific information can be found in the June Meeting Notes. Members should notify the Leadership team of their participation either via email or at the August 4th meeting. Quilts should be completed and submitted to the Guild by mid-August. In the event that the library space does not accommodate all of the quilts, a drawing/lottery will be held to determine which quilts will be included in the show. ALL mini-quilts will be included – no lottery necessary. Additional details about the quilt show will be provided via email, posting on the blog, and at the August 4 meeting. The “crafty” part of this meeting was making nametags. Members spent time during the last half of the meeting sewing mini modern blocks and embroidering their way to some clever and fun nametags. We definitely have a creative group! Members are encouraged to upload photos of their completed name tags to the Guild’s Flickr group page. Lastly, the August 4, 2013 PGH MQG meeting will take place at a different location. The Guild is excited to visit a new quilt store, Stitch Studio, which is scheduled to open in September. The store’s owner, Erin Kortering, has graciously invited the Guild to hold its August meeting at the store. The meeting time will remain the same, 1:00-4:00pm. The address is 447 Beaver Street, Sewickley, PA 15143. Looking forward to seeing you all there! *Special thanks go out to Kathy for the birthday "candy" and for taking these notes! Yesterday at the monthly guild meeting/birthday quilt-a-bration I mentioned the Not Fade Away one day conference to the group. This one day conference is being presented by the Alliance for American Quilts (aka Quilt Alliance) in Herndon, VA on Saturday, July 20, 2013 from 8:00am - 6:00pm. Registration for is $55 (for those who are not members of Quilt Alliance). Please feel free to drop us an email if you have any interest in attending this conference.